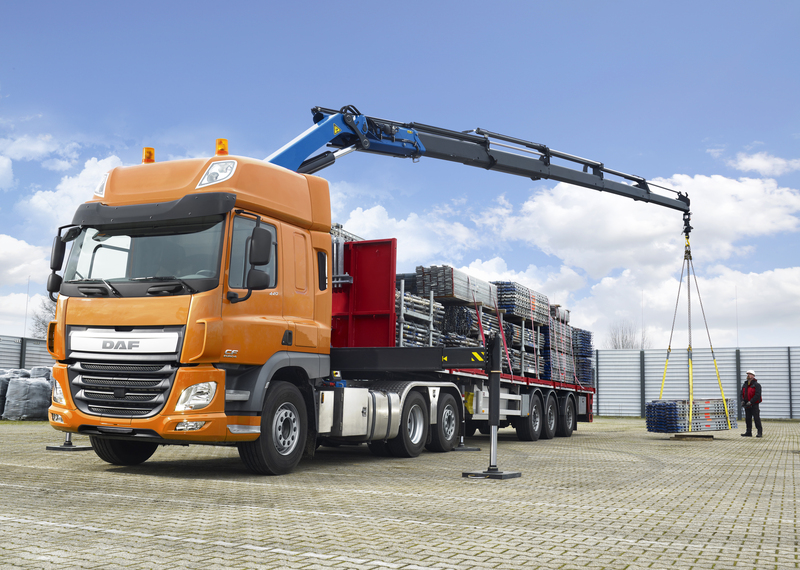 DAF introduces tractor with steered trailing axle - DAF Trucks N.V.
DAF is launching the CF and XF tractor units with a steered trailing rear axle. These units have been specially designed for applications requiring a high payload combined with maximum manoeuvrability. The three-axle CF and XF tractor units have a steered trailing rear axle (7.5 tonnes) with single assembly mounted behind the driven axle (13 tonnes). This makes the new versions ideal for tasks where there is relatively little room for manoeuvre and additional payload is necessary; for example because of the presence of a loading crane behind the cab. The CF and XF tractor units with steered trailing axle will therefore frequently be used for transporting construction materials and machinery. DAF offers the new three-axle tractors as CF and XF with choice between the efficient 10.8 litre PACCAR MX-11 and 12.9 litre PACCAR MX-13 engines, with ratings of 291 kW/396 hp to 375 kW/510 hp. In the context of DAF Transport Efficiency, important enhancements have been made to these engines and, in combination with innovative technologies such as Predictive Cruise Control with Predictive Shifting and Eco Mode, fuel savings of at least 5% are achievable. The CF tractor unit with steered trailing axle is available with the Day Cab, Sleeper Cab and Space Cab; the XF is available with the Space Cab and Super Space Cab. All models are available now.